Note: The finished garland is about 36” long. 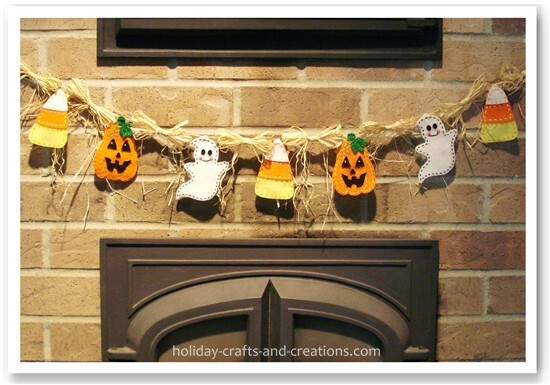 If you want your finished garland to be longer, just add a few more ghosts or pumpkins. Print out the Halloween garland template. Trace and cut out 2 ghosts from white felt. 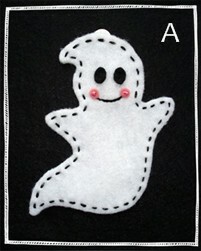 Stitch around the border of the ghosts with black thread, using the running stitch. The stitches should be about 1/8” in from the edge. See photo A. Now cut out the eyes for the ghosts from black felt. Stitch them on with black thread using the running stitch around the edge. To make the mouth for the ghosts you will also use black thread. Start by drawing a light pencil line as a guide to where you will want the mouth. Then stitch the mouth using the back stitch. After you are done stitching the mouth, cut out the cheeks from pink felt. These will be stitched on using a French knot. Again, see photo A. Trace and cut out 2 pumpkins from the provided template, using orange felt. Also cut out 2 leaves and 2 stems from green felt. Using the running stitch, stitch along the edge of the leaves. See photo B. 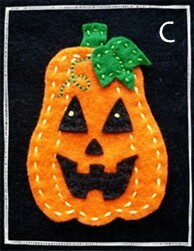 Attach the stem to the pumpkin as you stitch along the top edge of the pumpkin, using the running stitch. Now continue to stitch along the edge and inner lines of the pumpkin. The stitches should be about 1/8” in from the edge. Again see photo B. 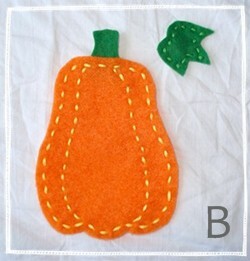 Now attach the leaf to the pumpkin using the back stitch down the center of the leaf. Also stitch along the edge of the stem using the running stitch. Trace and cut out the pumpkin face from black felt. Using the running stitch, attach the face to your pumpkin. See photo C. The yellow dots in the eyes were made using a French knot. Use the back stitch to add the vine to your pumpkin. 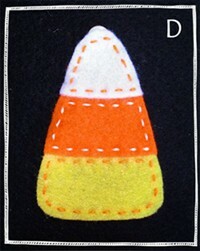 Trace and cut out 3 white candy corn tops, 3 orange middles, and 3 yellow bottoms. Place the white top piece on top of the orange middle piece with about 1/4” of overlap. Using the running stitch, stitch the white top to the middle with orange thread. Now using white thread, stitch the middle piece to the bottom piece. Now stitch the bottom piece with orange thread. 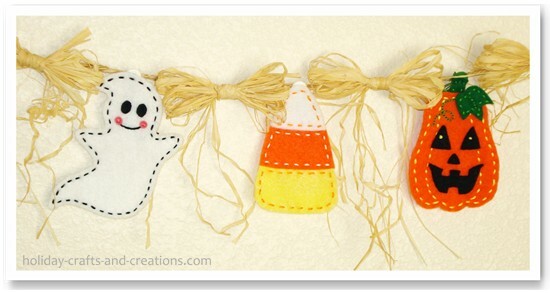 See photo D.
Sew a button onto the back of each pumpkin, ghost and candy corn. Sew it close to the top of the felt, using only the bottom 2 holes of the button. The top 2 holes will be used to attach the felt shape to the jute or string. 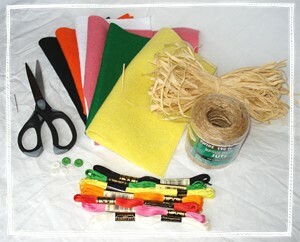 See our How to Make a Raffia Bow page to learn how to make these bows. Make 8 bows. Start at one end with a raffia bow. Tie the bow on with about a 10" piece of raffia. Just wrap it around the bow's center and tie a knot in the back. The felt pieces will be tied on with a piece of embroidery thread anchored through the button. Your Halloween garland is now finished! I found this one in 2010... very nice.